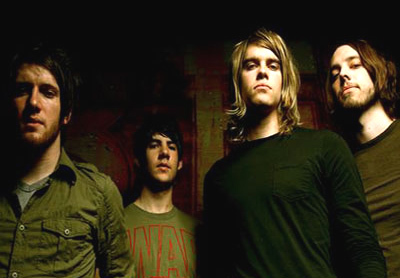 An outgrowth of the short-lived Texas Christian band Terminal, guitarist James Erwin, bassist Lucas Starr, and drummer Ryan Conley, regrouped with a pair of local Fort Worth musicians, singer Micah Kinard and guitarist Shane Blay, to form Oh Sleeper in the spring of 2006. Their debut EP, The Armored March, was released by 1x1 Music in November of that year. Containing the single "We are the Archers," it is a clear introduction of their sound that brings with it heavy and dark guitars. The songs are also recycled for the group’s first full length album When I Am God produced by Solid State Records in 2007. When I am God contains the new songs "Building the Nations," "I Will Welcome the Reaping" and "Vices Like Vipers". Starr explains: "At the end of the day, a song is nothing more than a bunch of notes and chords strategically thrown together. Don’t get me wrong, music is awesome but I feel there is something more to this life than writing a hit song and selling records. Anyone can learn how to play an instrument, but what good is it if you only use that talent for self gratification?" On the follow-up to their When I Am God debut these Texan lads obliterate any notions of the "sophomore slump" with the release of Son Of The Morning in 2009. As a concept album detailing the final battle between the devil (with Micah Kinard screaming in character on the title track) and God (with Kinard answering on "The Finisher," which closes the record) from start to finish, Oh, Sleeper's Son Of The Morning is poised to turn 2009 upside down. If "The New Breed" and "Commissioned By Kings" (with it's "bring out the dead! bring out the dead!" chorus) don't get your fists pumping, nothing will. "A Banquet For Traitors," "In All Honesty" -- Epic moments, driving moments, pummeling and punishing moments -- all are to be found in abundance throughout the record. A few tasteful doses of electronics can be found on the record which combined with Blay's soaring vocal melodies lend balance to the otherwise ultra-heavy assault. The broken pentagram adorning the cover of Son Of The Morning represents evil vanquished, both inside and out. This album is sure to excite anyone with even a cursory interest in bands like Underoath, Slipknot or Dillinger Escape Plan.